As an alternative to extended ACLs, you can set up shares using POSIX ACLs. For details, see Setting up a Share Using POSIX ACLs. Samba does not support using POSIX ACLs on a DC. You must use Windows ACLs. user and system xattr name spaces. extended access control lists (ACL). For further details, see File system support. To create a share with extended access control list (ACL) support, the smbd service must have been built with ACL support enabled. A Samba host working as an Active Directory (AD) domain controller (DC), is always enabled with extended ACL support. Samba was built using the --with-acl-support=no parameter. The Samba configure script was unable to locate the required libraries for ACL support. For details, see Package Dependencies Required to Build Samba. On a Samba Active Directory (AD) domain controller (DC), extended ACL support is automatically enabled globally. You must not enable the support manually. Alternatively, to enable extended ACL support only for a specific share, add the parameters to the share's section. For further details about the parameters, see the smb.conf(5) man page. 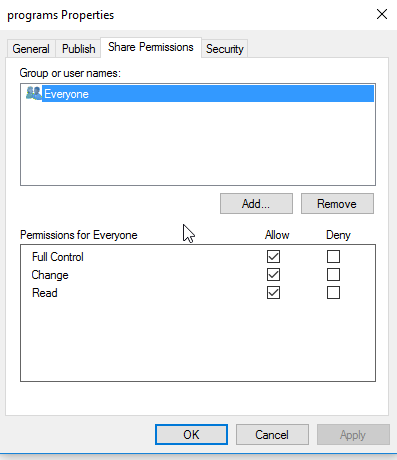 Only users and groups having the SeDiskOperatorPrivilege privilege granted can configure share permissions. Only users or groups that are known to Unix can be used. This means that if you use the winbind 'ad' backend on Unix domain members, you must add a uidNumber attribute to users, or a gidNumber to groups in AD. 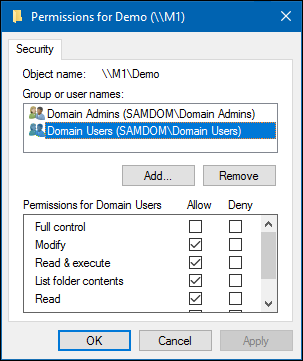 # net rpc rights grant "SAMDOM\Domain Admins" SeDiskOperatorPrivilege -U "SAMDOM\administrator"
It is recommended to grant the privilege to a group instead of individual accounts. This enables you to add and revoke the privilege by updating the group membership. # net rpc rights list privileges SeDiskOperatorPrivilege -U "SAMDOM\administrator"
You need to grant the SeDiskOperatorPrivilege privilege on the Samba server that holds the share. Further share-specific settings and file system permissions are set using the Windows utilities. Do not set additional share parameters, such as force user. Adding them to the share definition can prevent you from configuring or using the share. When you configure a share with extended access control lists (ACL) support, you set the share permissions using Windows utilities instead of adding parameters to the share section in the smb.conf file. Log on to a Windows host using an account that has the SeDiskOperatorPrivilege privilege granted. e.g. 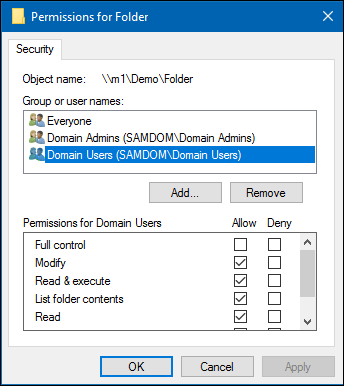 SAMDOM\Administrator or SAMDOM\john where john is a member of Domain Admins. Click Start, enter Computer Management, and start the application. Select Action / Connect to another computer. Enter the name of the Samba host and click OK to connect the console to the host. Open the System Tools / Shared Folders / Shares menu entry. Right-click to the share and select Properties. Samba stores share permissions in the /usr/local/samba/var/locks/share_info.tdb database. For details about using the SYSTEM account on a Samba share see The SYSTEM Account. For details where the ACLs are stored, see File System ACLs in the Back End. Select a user or group from the list, Domain Users for instance. Select permissions to grant, Full control for instance. Click OK to close the Permissions for Demo window. Click OK to store the updated settings. For further details about configuring share permissions and ACLs, see the Windows documentation. Log on to a Windows host using an account that has Full control on the folder you want to modify the file system ACLs. Right-click to the folder and select Properties. Select the Security tab and click the Edit button. Click OK to close the Permissions for Folder window. For further details about setting ACLs, see the Windows documentation. This page was last modified on 3 April 2019, at 12:03. This page has been accessed 327,936 times.